A dental implant is a surgically inserted titanium post that is affixed to your jawbone and replaces the roots of a missing tooth. 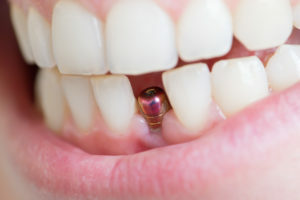 The security provided by the placement of the post in your jawbone, and the strength and biocompatibility of titanium make the dental implant procedure the gold standard for tooth restoration. The First Visit – At the first visit, your dentist will perform the initial surgery to place the implant, abutment (the piece that attaches the implant to the crown) and a temporary crown (the visible portion of the tooth). You will spend the next few months allowing your face and gums to heal, during which time your custom-crafted permanent crown will be fabricated. The Final Visit – After you’ve healed sufficiently, you’ll return to your dentist for the placement of the permanent crown. You’ll leave the office with fully functional and aesthetically pleasing teeth. After you’re able to enjoy the fruits of a full restoration, you want to ensure the longevity of your dental implants in Collierville. Perform Excellent Oral Hygiene – For most people, their tooth loss began with poor oral hygiene and the growth of bacteria. So to prevent tooth decay and gum disease in the future, be sure to brush and floss your teeth at least twice a day. Visit Your Dentist – Maintaining regular visits to your dentist is vital to your oral health and to the longevity of your dental implant. These appointments will provide you with thorough cleanings to protect your natural teeth and gums from gum disease and tedious checkups, during which time your dentist will also be taking note of the condition of your dental implant. Avoid Teeth Grinding – If you grind your teeth (bruxism), you run the risk of unseating your implant. This problem varies, as it may affect you when you sleep or in an awakened state when you’re stressed. If you suffer from this condition, you speak with your dentist about the possibility of wearing a mouthguard at night. In addition, you may consider embarking on a new fitness or meditation journey to accommodate any stressors you may have. Avoid Extreme Temperature Changes – It’s common after eating a savory meal to crave a sweet dessert like ice cream, but you should be careful not to introduce extreme temperature changes to your crown restoration. Since it is made of porcelain, the changes will cause the material to expand and contract. The solution is to wait a while before introducing an extreme difference in food or beverage temperatures to your mouth. Now that you’re well versed in how to care your dental implants, you can confidently prepare for this highly successful procedure to restore your smile. Reach out to your local dentist today to schedule a consultation and get ready to reclaim your life! Dr. Joshua Holcomb earned his Doctor of Dental Surgery degree from the UT Memphis College of Dentistry. He specializes in fixed and removable prosthodontics, oral surgery, implantology, conscious sedation, reconstructions and a host of other modalities. Dr. Holcomb can be reached for more information through his website.